Christopher Campbell, Partner at CapVest, stated: "NextPharma is an excellent business with a leadership position in a growing market and we look forward to supporting management on the next exciting phase in the company’s journey." GCA Altium presented various financing scenarios to CapVest, involving both senior banks and debt funds. 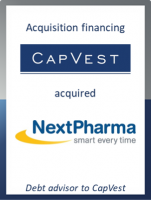 "We are convinced that CapVest is the ideal partner for the management team of NextPharma. The chosen financing structure gives the company the flexibility needed in combination with very attractive terms," commented Norbert Schmitz, Managing Director at GCA Altium.